A look at Homeacres in January 2014. Stefano Mancuso, Professor of Plant Science, University of Florence, Italy. 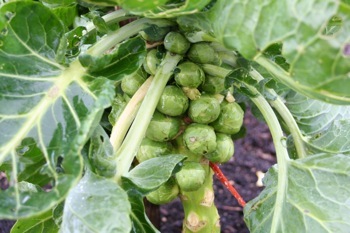 I wish you all a happy new year, learning from plants and enjoying their healthy harvests. This piece is more pictures than words, I am on a tight book deadline and still some to write. The photos tell some nice stories. If any of you live near Oxford and have time to come along, I am speaking there on Tuesday January 7th at 11.30am in what looks an interesting conference www.oxfordrealfarmingconference.org/orfc-2014.html and it is to keep the world sane by comparison with the big-farmers’ conference nearby. 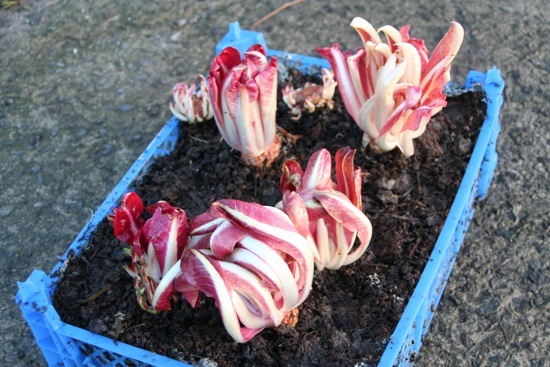 Continuing an Italian theme – finally I have worked out how to grow TREVISO chicory, after pulling out its roots and forcing them in this tray in darkness. 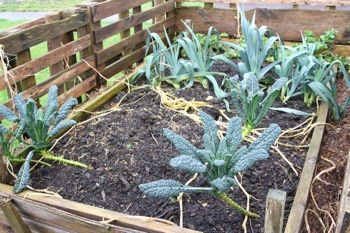 I put them in the shed in late November and the mild weather has brought them on. The seed packets do not mention forcing but I read about it in an article. 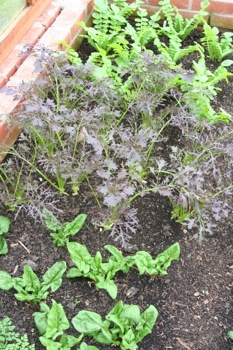 The same plants yesterday, and they have given so many meals of tasty leaves, with never a flower. 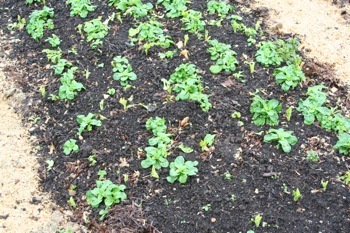 Between the lambs lettuce are broad beans emerging, sown a month ago. 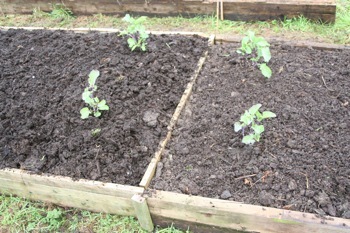 The view shows beds either growing salad or mulched. 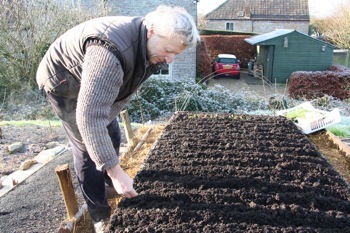 Advice for this month – do not sow seeds, just wait. 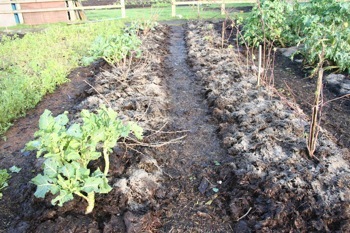 January sowings are generally a waste of seed, except for broad beans. Also although it is mild now, the weather will turn colder at some point, perhaps on the full moon of mid month. Mostly nice figures, rainfall below average and sunshine above, summer warm, autumn mild. 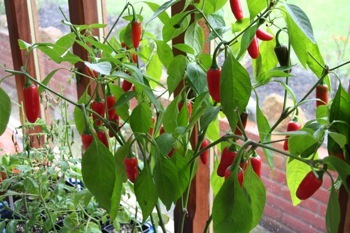 Habanero chilli in a pot in the conservatory. 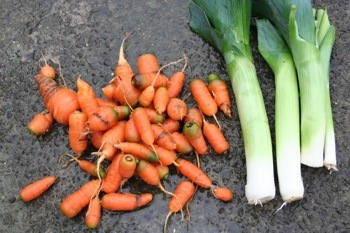 Harvests from the hotbeds as I dismantle them, leeks are Bandit which would carry on growing. 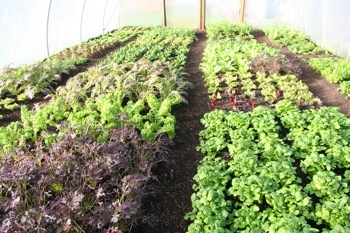 Mustard Red Frills, salad rocket, mustard Red Dragon, land cress. 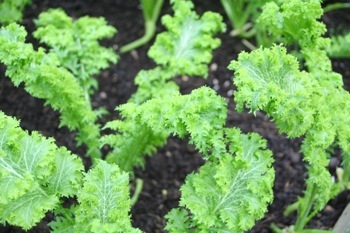 Pizzo mustard is so pretty and bright. 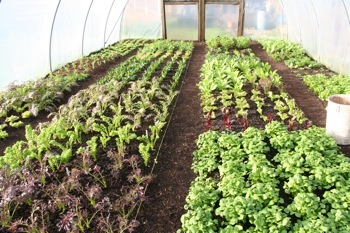 Winter purslane (claytonia), Winter Gem lettuce and Grenonble Red. 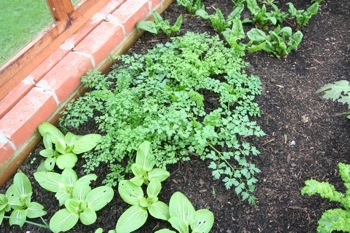 Microleaves dill, coriander, sorrel sown late Oct and ready to cut now. 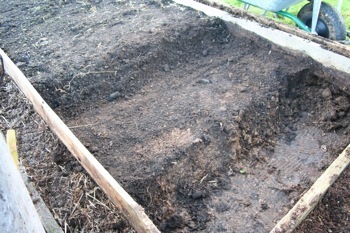 You can see the top bed of fine compost which I use to make a new bed. 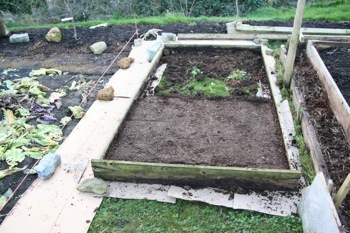 he less rotted, woody manure has mulched apple trees. Card is around edges to mulch grass, dandelion, buttercup. 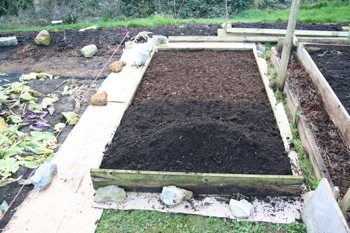 filled the bed to maximum then leveled and trod the compost lightly. 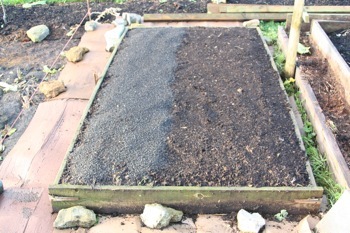 On the left I spread an inch of rockdust to compare growth. Lots of rockdust trials next year. Ah the weather! 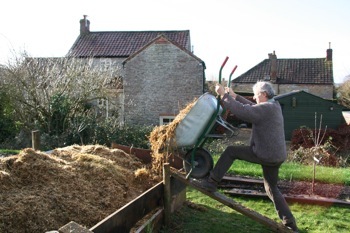 Although we have come out of a horribly wet spell, the rain continues here, less of it but still more than one needs for gardening at this time of year. You can see from the photos how Homeacres soil is now saturated, and I expect your plot is too, but if drainage is correct it is surprising how quickly soil returns to normal moisture levels. 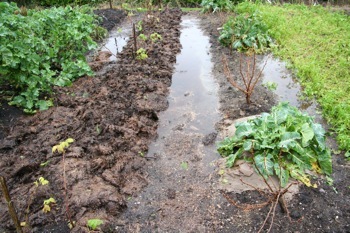 The surface water here never lingers more than two or three hours after rain stops and my undug, surface composted beds are looking good, not a lot growing now but some leeks, kale, purple sprouting (to crop in April, a late variety), winter salads, Brussels sprouts – and even the first shoots of rhubarb are looking good. On January 4th after a night of rain. 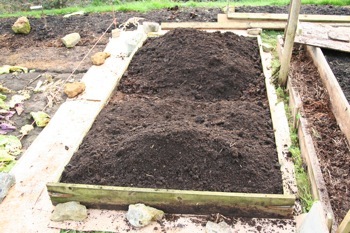 Ten days later on after some drier days, the beds have a little wood ash on top of the cow manure compost. 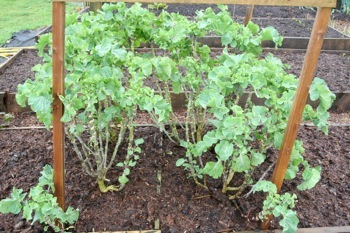 After picking one side of both middle beds, purslane still to pick. 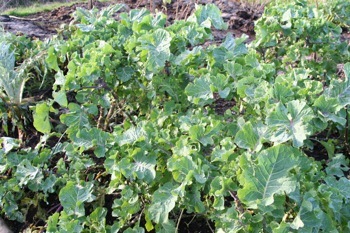 These healthy plants should be producing until late April. 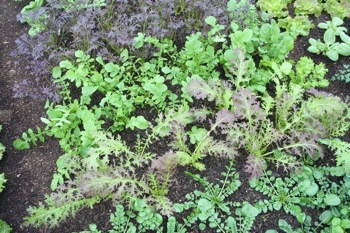 Salads undercover, out of wind and rain, are growing beautifully, and thankfully are contradicting the theory that growth is minimal when there is less than ten hours between sunrise and sunset (‘Persephone effect’ after Eliot Coleman). Incidentally Eliot is at a more southerly latitude than Britain, about 47N which is the same as southern France (while Homeacres is 51N), and Portland in Maine has an average January sunshine of 156 hours, more than we have here for the three months of December, January and February combined. 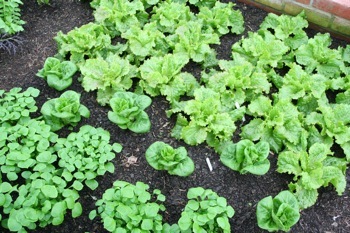 So the current growth of winter salads undercover really is impressive. 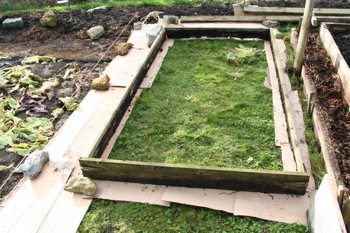 I was fortunate on January 13th to have the help of a friend Michael Denney to assemble a huge hotbed. 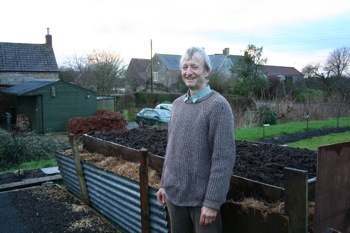 He runs a garden-help business, see [email protected] Luckily my neighbour Jenny allowed us (Mick in fact, he was an engineer before!)) 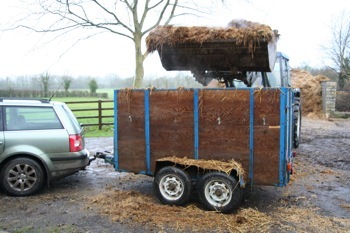 to use her tractor for loading fresh horse manure from the enormous pile, into my car trailer. 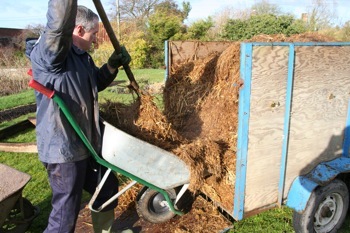 Two trailer-loads plus six barrow-loads, around two tons altogether. That was the morning accounted for, in lovely sun mostly. 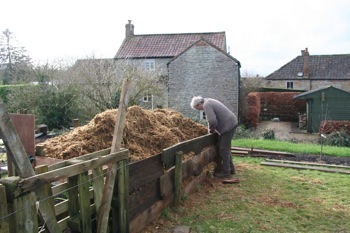 Fixing the final plank after tipping the last barrow-load of fresh manure, then it was raining by the time we were filling the top bed. 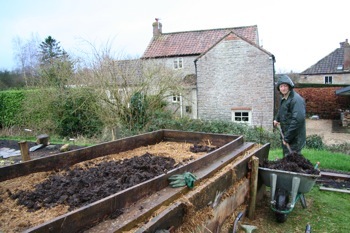 However after lunch we had cold rain as a showery trough stagnated over east Somerset, so filling the top, growing bed with well rotted compost and manure was quite a job. 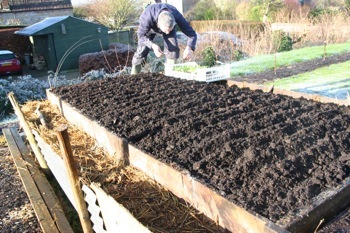 In fact it was too sticky to make a nice finish and we did that on Tuesday 14th, as much as possible with the slightly lumpy cow manure and homemade compost, capped by a little multipurpose in the drills. 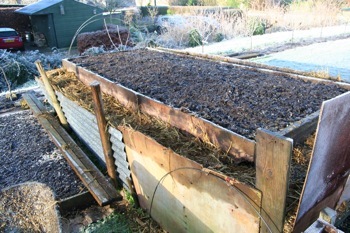 After sowing, we covered the bed with fleece, to conserve the fresh horse manure’s lovely warmth. 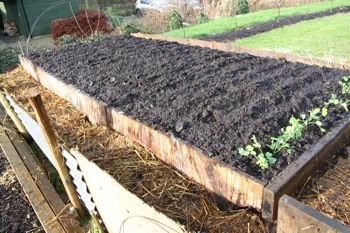 All sown and some peas planted, for shoots. Interestingly this date of January 14th is two days before full moon, the time discovered by Kolisko as being a “horoscope” for the most growth of any seeds sown at that timw, when the moon’s waxing forces are strongest. But 14th was also a Flower Day in Maria Thun’s calendar, so you can’t win them all! 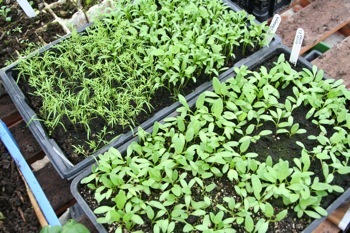 Next day before full moon is February 12th, which is Flower in the morning and Leaf in the afternoon, so I shall sow some lettuce just to see the difference. 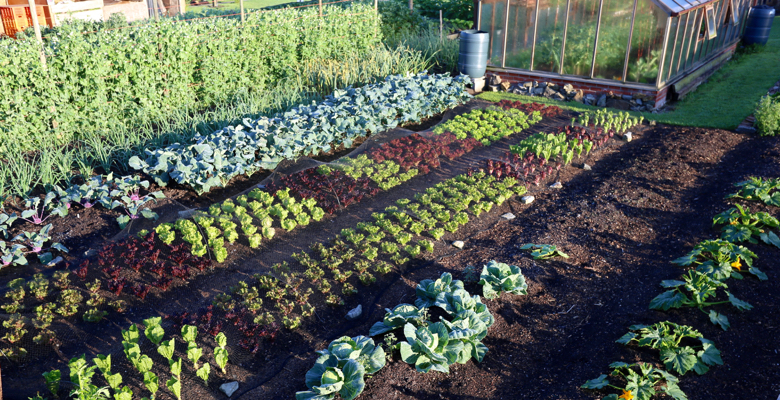 If you are starting out with a weedy plot, this is an excellent time to mulch with any combination of light excluding materials. 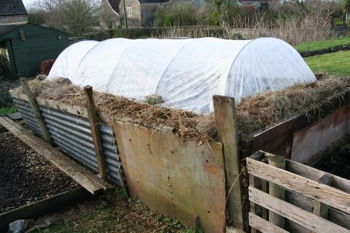 From compost to manure to mypex to polythene to cardboard. 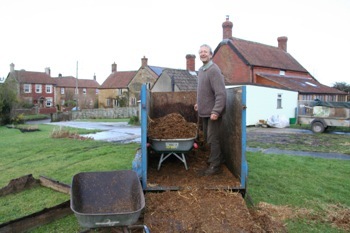 See the archived posts for This Month for January to March 2013 which show how I was doing the mulching here, on weedy pasture. 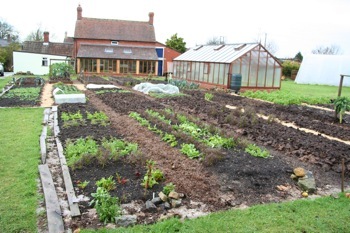 Now there are almost no weeds left and beds, paths are beautifully clean; field bindweed is the sole survivor, not growing at the moment but because it has been so mild, there are actually a few shoots in the greenhouse, unusual for January, and…..
Daubenton kale is prolific even in midwinter, and Filderkraut cabbage are storing well. 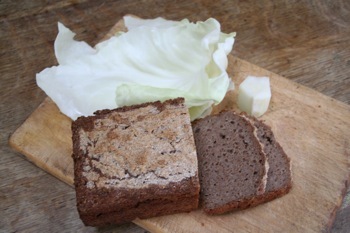 Here with sourdough bread I made after not using the starter for a whole four weeks, sitting on the larder window.